Getting married in Thailand? Australian couples should read this first! So many beautiful wedding locations. So beautiful, so simple…But wait! Now that you’re thinking about getting married in Thailand, it’s important to know what will happen if you do marry in Thailand. There are a lot of legal procedures to take care of! 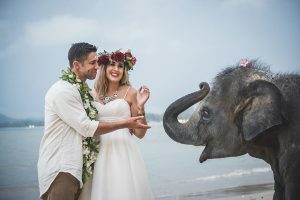 If you want a wedding which is properly recognized in Australia, you need to know that you will spend 4 to 5 days in Bangkok visiting embassies and filling out forms. What couples are now doing instead, quite sensibly, is to get “legally married” in Australia before their Thailand holiday. These couples then have a non-legal (but beautiful!) wedding ceremony in Thailand. Visit the Australian Embassy in Thailand (in Bangkok) (ensure your passport is up to date and valid for at least six months. Check that there is no Thailand public holiday because Embassies in Thailand will be closed on those days. Apply for an “Affirmation of freedom to Marry” from the embassy. This legal form makes clear that you are legally able to marry. In most cases you will have to return the next day to collect this form. You will need to provide your passport and proof of termination of any former marriage, for instance divorce, or death certificate). Photocopied documents won’t be accepted so make sure you bring the originals. Once you have received this “Affirmation of freedom to marry” form, you have to get a Thai translation. None of the embassies provide this service. What you’ll have to do is go to a nearby translation company who will probably charge around $40AUD to translate it. Once your documents have been authenticated then you need to take them to an “Amphur Office” (district Registrar). In Bangkok, this is known as “Khet”. For your marriage to be legally valid within Thailand’s laws, it has to be registered at the Amphur Office. A religious ceremony or civil ceremony is not recognized by the Thailand government. You will only be legally married once you register at an Amphur Office. It is recommended that you bring someone who can speak Thai. Actually, the marriage registration can be filed at any Amphur or Minor District Office in Thailand, it doesn’t have to be an Amphur in Bangkok. Foreign nationals getting married in Thailand have to provide a copy of their passport along with an authenticated affirmation (with certified translation). If your partner is a Thai national they will have to submit their ID Card and Household Registration Certificate. As soon as your marriage registration is finally completed, you and your spouse will each receive a copy of the Marriage Registration Certificate as confirmation. Your Thai marriage certificate will of course be in Thai, not English. It is recommended that you get a certified translation of your marriage certificate from a translation office so it can be recognized legally in Australia. As you can see, there’s a fair bit to getting married in Thailand. Similar situations can be found in other countries, also. So why bother with the rigmarole? Instead, have a Simple Wedding. You can get “legally married” in Australia before your Thailand holiday. Then, have a non-legal (but beautiful!) wedding ceremony in Thailand. Simple Weddings conducts simple, brief, legal wedding ceremonies, for a lot less than even the Registry Office. At just $199 for a Tuesday wedding, it’s the best value in Australia. What’s more, you can generally get married within just 4-5 weeks of booking. Or just add your details on the right and Simple Weddings will be in touch.